Although I read a lot of horror and speculative fiction, it's actually quite rare that I come across a book that I'd call genuinely frightening (I'd say the last one that caused me to lose sleep was Michelle Paver's Dark Matter). Bird Box, however, was certainly in that category. 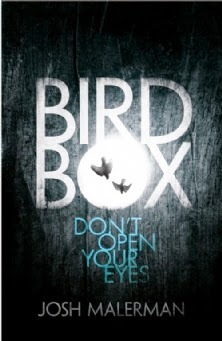 Bird Box, Josh Malerman's first book, is a dystopian horror novel. The basic premise is a relatively familiar one: a disaster has rapidly wiped out civilisation as we know it and a few survivors are left struggling in isolation and constant danger. What sets Bird Box apart here is the uniquely terrifying and brilliantly conceived cause of this apocalyptic scenario: people are being driven to violently insane and suicidal rages by something they have seen. Which means the only way to stay alive is never to see the danger. They hear it. The sense it. Sometimes, they almost feel its touch, its tangible presence passing by or lurking with them in an enclosed space. But if they are to survive, they can never, ever see it to understand what, or who, it is - and as such, are locked in a constant fearful, desperate stalemate. Bird Box begins with a young woman, Malorie, striking out from an abandoned home full of reminders of past terrors, with two unnamed children, 'trained' to navigate their way around the outside world by hearing alone. The children have never seen sunlight, and Malorie must guide them, all three of them with their eyes covered by ever-present blindfolds as they feel and stumble their way to what might not prove to be safety anyway. The novel then alternates between past and present, detailing the build-up to the children's births and the fate of the small group of survivors of which Malorie was once a part. Both narratives are full of nerve-shredding tension and slow, creeping terror - not just from the threat of the unspecified something that lurks outside, but also from the inevitable claustrophobia and unease of a community of mismatched individuals living together in a single house with limited resources. Bird Box certainly drives home the message that sometimes, as one of the survivors suggests, 'we do it to ourselves ... man is the creature he fears'. The premise of Bird Box alone is, frankly, quite terrifying enough in itself, but Josh Malerman's ability not only to build suspense but also to deliver climactic shocks is exceptionally effective. Moreover, Malerman never lets genre compromise the quality of his prose: every sentence is tautly constructed and the variations in pace and structure are spot-on throughout. There is also far more to Bird Box than horror. The moral difficulties Malorie faces when it comes to bringing up her children, for instance, and the elements of motherhood that she's forced to sacrifice for the sake of their survival, are subtly expressed but no less heartbreaking for it. Bird Box isn't just a great piece of speculative fiction: it's a great piece of fiction, full stop, and it stands out a long way from the crowd.